Amazon Echo is a hands-free speaker you control with your voice. Echo connects to Alexa Voice Service to play music, make calls, answer questions, provide information, news, sports scores, weather, and more – instantly. All you have to do is ask.Alexa, play top Bollywood songs. Want to play music on an Echo device in another room? Now with multi-room music, you can tell Alexa to play the same song throughout your whole home. Just ask for a song, album, artist, or genre from Amazon Prime Music, Saavn and TuneIn. 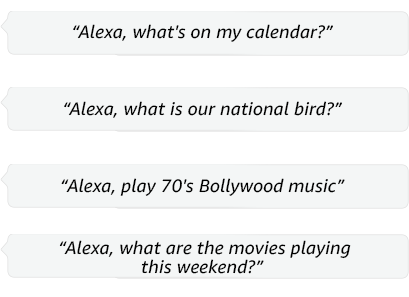 Simply use the Alexa App to create groups with two or more Echo devices by naming the group, such as “my home.” Once you’ve created the group, simply say “Alexa, play Bhangra in “my home.” Learn more. Introducing Alexa calling and messaging—a new way to be together with family and friends. Use your Echo device to call or message anyone who has an Echo device or the Alexa app. When you’re busy making dinner, just ask Alexa to place a call to Mom or send a quick voice message to a friend. You can also enable “Drop In” in the Alexa app for when you want to instantly connect with other Echo devices in your home, or your closest family and friends. Alexa calling and messaging is available within India at no additional cost—to get started, download the Alexa app on iOS and Android. Learn more. Use Amazon Echo to switch on the lights before getting out of bed or dim the lights from the couch to watch a movie – all without lifting a finger or … even raising your voice. With “Routines ” control your devices at scheduled times or with a single voice command, like turning off the lights when you go to bed or turning on your coffee machine every morning. Echo works with devices such as smart lights and plugs from brands including Philips, SYSKA LED, Oakter, TP-Link and more. Explore now. Customize your Echo for any room with the optional Echo shell available in a range of colors. Warranty and Service Amazon Echo is sold with a limited warranty of one year. Use of Amazon Echo is subject to the terms found here.